Bagel heaven is located on Bathurst Street, about two blocks away from my grandparents’ house in Toronto. New York bagel purists may disagree, but Gryfe’s bagels are the best, and there’s no convincing me (or my sister) otherwise. They look like “regular” bagels, but they’re lighter and fluffier and have this crispy crust and a slightly salty poppy-seed topping that’s irresistible. These bagels are so delicious and so (relatively) light, that you can eat two and maybe three fresh ones in no time flat. I’ve often done just that. When we were kids, we’d walk over to Gryfe’s with my grandmother at least a couple times a week to stock up on bagels (well, she called them “bagel”, as in, “I need to pick up some bagel”) and (my lunch staple) mini cheese pizzas made from the same bagel dough. If we were lucky enough to get a batch just out of the oven, we’d scorch our fingers because we couldn’t wait; we’d start at the “weak point” of the bagel (the slightly less done oval on the side of the bagel where it rested against its partner) and dig out the inside of the bagel dough until all we had left was the crispy, salty shell. Over the years, Gryfe’s has garnered quite a following. The small bakery near my grandparents’ house is still there, and, most mornings, there’s a line down the block for people waiting to get in. But they now have other locations, a fancy(ish) web site, and are even selling their bagels throughout Canada (and even frozen pizzas in select US locations!). The staff at the Bathurst Street location has changed from little-old Jewish women to little Asian women, but the bagels and the pizzas remained the same (did I mention the apple turnovers? yum). They offer a few more flavors of bagels these days (I actually don’t remember their offering anything besides poppyseed when I was a kid), but otherwise, they haven’t changed much at all — thank goodness. So, whenever we go to Toronto, we stock up on bagels and pizzas. We fill our stomachs and our cheek pouches with as much as we can stand during our visit, and then we store the rest in luggage and bring it back home to freeze and enjoy for the next few months. But it’s been too long since we were in Toronto and we are out of Gryfe’s. Completely out. They won’t deliver to Thetford or Medford (hey! this is the first time I’ve noticed that my sister I and I both live in “ford”s!). What can we do? The only possible choice (aside from a weekend road trip to Toronto) is to try to make them ourselves. 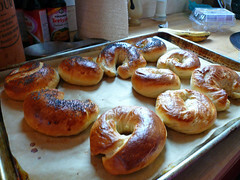 Anyway, this past weekend, Laurel and I both attempted to recreate the Gryfe’s bagel in our home kitchens. 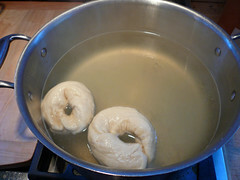 I followed hillel’s recipe pretty closely for my first attempt. My only change was to use 2.5 tablespoons of sugar instead of the 3 called for in the recipe because the ingredient list only specified 2 tablespoons, but the instructions used a total of 3. 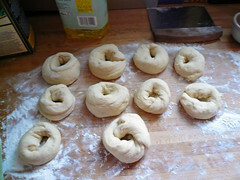 I also followed hillel’s shaping preference, by shaping the dough into a “pipe” and then forming the pipe into a circle. And then baked them as described by the recipe. The results? Close, but no bagel. The smell was right, and the taste was close (a bit too sweet), but the texture wasn’t right. The inside was too doughy and the crust didn’t have the right crispness. Oh, we managed to eat them all, though. Don’t you worry. The next day, I tried batch #2 with even less sugar (and less honey in the poaching water). I used the other method for shaping (much better!) and I baked them at a higher temperature for a little less time. I also included a little salt with the poppy seeds. Closer… still not the right crust, but better. These bagels actually looked gorgeous, but I didn’t think to take a picture. After I told Laurel about my attempts, she tweaked the recipe further to eliminate the egg (probably not in the true Gryfe’s recipe), let them rise longer before poaching, and bake them on a stone. Still even closer. It’s not quite Gryfe’s yet, but it will do for now. Anything for a fellow Gryfe’s lover! Since the links are now broken, I’ll update this post with the recipe. Stay tuned. Hi again! 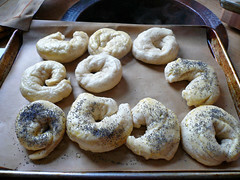 I’ve found the original recipe post here (http://hillelcooperman.com/bagels/), but I’m going to write a new post soon with some recipe changes that get a bit closer (I think) to Gryfe’s.